Description: Vasvar (Eisenburg) is a small town Vas county (Western Hungary), 4,600 inhabitants. It was already inhabited in Roman era (Castrum Ferreum). The Dominican church and monastery was built in 1684. The history of the organ adventurous and unfortunately many details as incomplete. The organ was built 1639 by an unknown master of the Dominican church to Szombathely (Hungary). 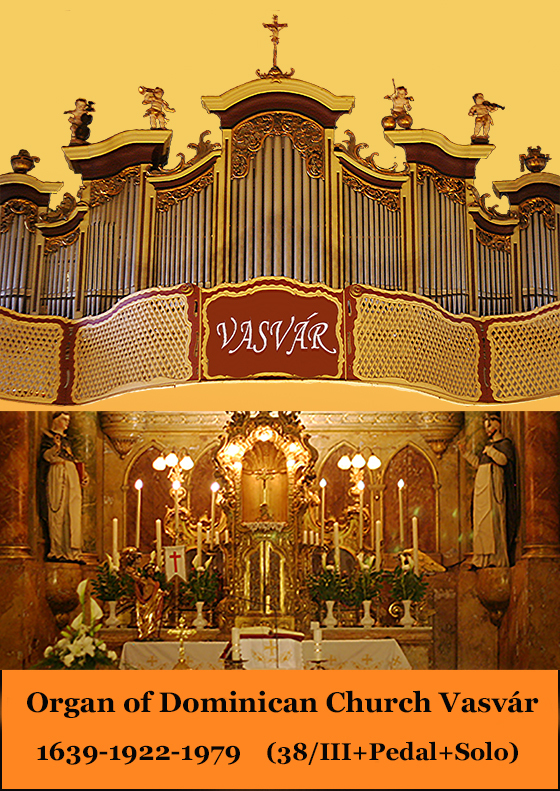 140 years later, the new, bigger organ was built and the old organ delivered to Dominican church of Vasvar. There it worked until 1922, when the Angster organ factory rebuilt and expanded it(3 manuals and 28 stops). Another major rebuilding done in 1979 by the Budapest Organ Factory. The organ's documentation is very incomplete, but still many of the original pipes are in it. The organ is not in good condition. Has a health check (Váradi and Son) that organ must be destroyed and to build a new organ into the old organ-case. Fortunately this has not happened yet!